And unlike gyms, they’re free. If you’re thinking swing sets and slides, you’ll either be disappointed or relieved. 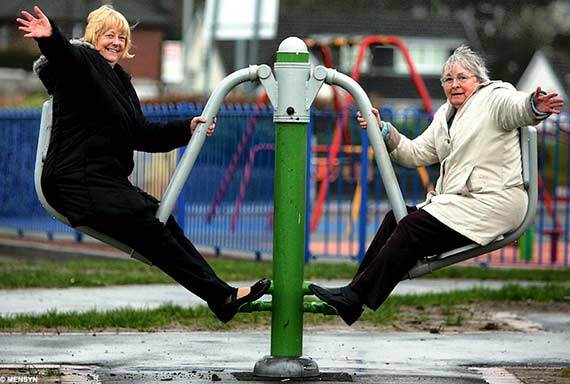 Most playgrounds for older people feature low-impact exercise equipment designed to promote flexibility, balance and coordination, along with areas that promote community. But just like kids’ playgrounds, they’re meant to be fun. “If you make it playful, people will enjoy themselves. It won’t feel like a workout, and they’ll want to come back,” says Michael Cohen, the founder of Must Have Play, the first U.S. company dedicated to designing wellness playgrounds for seniors. Also known as outdoor fitness parks, senior playgrounds started cropping up about two decades ago in China, after a national law came into effect that mandated fitness programs for all ages. The idea spread during the 2000’s to England, Japan, Finland, Japan, Germany, Canada and Spain, where more than 40 percent of the population will be 65-plus by 2050. Barcelona now boasts more than 300 senior playground installations. While the U.S. definitely has some catching up to do, the idea is taking hold here. Some 15 cities, from New York to San Antonio and Miami, already have outdoor senior playgrounds and multigenerational fitness parks, and more are on the way, though not as quickly as proponents would like to see. What Exactly Is a Senior Playground? Outdoor senior fitness parks might include elements like stationary and recumbent bicycles, side-by-side striders, face-to-face leg presses and hand-eye dexterity games. You also might find walking paths with ramps, steps and arches; games like bocce, ping pong or horseshoes; and shaded seating areas. You can get an idea of the variety of equipment by visiting this Pinterest board devoted entirely to images of senior playgrounds. (Video link for mobile) Whether you’re climbing, pedaling, using the elliptical or walking a trail, the most immediate benefits of senior playgrounds are wellness related. The best installations help to improve balance and minimize the risk of falls, build muscle strength and tone, extend your range of motion, and improve your manual dexterity. To some extent, these gains have been documented: A 2004 study by Finland’s University of Lapland looked at a group of 40 seniors age 65 to 81 who had access to a senior playground. After three months of regular use,90 minutes a week, the study found improvements in balance, speed and coordination. The seniors were more confident and moved faster, and felt empowered to manage physical obstacles when they met them. What’s more, the seniors in the study said they had fun taking on these challenges in company. Like any playground, those built for senior or multigenerational use also serve as social hubs. Face-to-face and multi-user equipment makes them great places to meet people and make friends locally, and once you’ve connected, you’re likely to show up tomorrow to meet again. Add the element of play, and you have the perfect solution for what sometimes ails us as seniors. A well-designed senior or multigenerational playground encourages light-hearted fun. Some things don’t change – playing outside in the open air relieves stress and improves our mood, just as it did when we were kids. As we age, we tend to become more fearful for our bodies. What if I fall? “If a kid falls, they may get hurt, but they’re probably going to get up,” Cohen says. “If an older adult falls, they might have a fracture. So, who’s going to be there to help them? They take calculated risks in trying something new, preferably because they’ve just seen someone else do it and enjoy themselves.” We worry about making fools of ourselves, too. In Finland, where senior playgrounds have been a thing for at least ten years, 63-year-old Irmelin Roskila told the BBC that she had started out feeling like “an elephant walking on a narrow beam” but found her agility improved rapidly, so that three months later she could say, “Even in everyday situations when I’m walking around I will now try out playground equipment. It has opened up new possibilities, not just physically.” By taking risks, we push ourselves outside our physical comfort zones and gradually extend our capabilities. Then we start to feel differently about ourselves. Senior Play in the U.S.
For people who spend time caring for grandchildren, multigeneration playgrounds make sense – and that’s the model that the nonprofit KaBOOM!, working with the Humana Foundation, is pushing in the United States. Since 2011, KaBOOM! Has built 53 multigenerational playgrounds across the country, according to spokesperson Sarah Pinsky. Many of KaBOOM’s playgrounds are in low-income communities. “One specific benefit of a multigenerational space is you get children and seniors interacting in ways they might not otherwise,” Pinsky told us. “Plus, it’s a great opportunity for children to see role models of active seniors.” Here’s a 2012 news report of the first multigenerational playground in NYC, this one in the Bronx. (Video link for mobile) Pinsky and Cohen both cite a growing need for and interest in playgrounds stateside because as a nation, we’ve become more and more attuned to the value of exercise for physical and mental health as we age. However, it’s taking longer than they’d like for cities and private community centers to jump in. “Any time you’re introducing something new and different in recreation, anything that requires municipalities to think differently, it can take time to see the fruits of that develop,” Pinsky says. Cohen elaborates: “The money’s there and the idea is solid. It’s conveying the vision and then having people in a position to make those decisions decide they’re going to make it happen.” How can we hurry up the process? Ask, and you may get! “It is really important for seniors to voice to their Parks & Recreation directors or their local elected officials that these are spaces they would use and value,” Pinsky urges. Cohen, who helped hundreds of grass-roots community groups worldwide build children’s playgrounds, sums it up, “We helped them go from one or two people with a vision to a thousand people in five days building an astonishing structure . . . We can do exactly the same for the senior community.” Senior and multigenerational playgrounds have been built across the U.S. Some locations include New York City, Miami, Harrisburg, Mobile, Jackson, Greensboro, Seattle, Cedar Rapids, Kansas City, Tulsa, Nashville, Houston and Fort Worth, New Orleans, San Antonio, Riverside and Tucson. For an interesting look at the development of senior playgrounds worldwide and how they differ, country to country, click here. Would you Use a Senior Playground? I would like information on where NY is purchasing the equipment for their senior parks. An organization I am involved with is interested in the possibility of providing one for our village. We would appreciate any help or ideas you may have to help is in this endeavor. Did anyone respond to your inquiry about where the equipment is being purchased? I would also like to know who the vendor is as we are considering creating a park for seniors here in San Francisco. Thanks! I love this article and believe it is so important for seniors to have a place where they can go out and Enjoy exercise. Just like it said, to use the equipment for balance and strength can greatly decrease the amount of falls that occur as people age. I was wondering where there are Playground designed for Seniors on the East Coast, specifically in NY or PA? It does seem to be true, when you age and sit at home in the beginning it seem relaxing but then your body starts to relax and you tend to not feel as good. If you have the opportunity to get up and move around, your body will respond in a positive manner most of the time too! Okay, so here it is March, 2016 and WHERE ARE THEY IN NYC OR BROOKLYN, NY?….I don’t see any, do you? ALL YOU DO IS “TALK” AND “NO ACTION”…………………..
They’ve had these sorts of ‘playgrounds’ in Turkey for many years. I always enjoyed seeing men and women in all stages of life and fitness keeping/getting fit and enjoying themselves in the fresh air. At the Midway Safe Harbor Center community learning center outside of Orlando, the playground and adult fitness equipment have brought children, adults and seniors together. According to the Center director Brenda Knight, it is common for grandparents in this community to be the primary caregivers while parents are working. Are there any plans for one in Manhattan, NYC? We could certainly use one. Not that we know of – but stay tuned for a new article about how to advocate for a playground in your neighborhood/city. We’ll post here when it’s been published. Don’t forget those of us living in more rural areas! Are there any senior playgrounds in Far Rockawayor Manhattan? Such would be of very much tremendous help in maintaining healthy participation in our lives, by building muscles, and raising our spirits..
Hi Alexandra, we are not aware of a senior playground in the Rockaways. But given the response to this article, we are going to research and write a second article about how a community can get one built. Stay tuned! We need senior playgrounds in Central Park and in Riverside Park. I love this idea (especially the ones that look more like fun than a bunch of pull-up bars)! I wish we had something like this in Irvine, CA, or near my 80-yr-old mom in Agoura Hills, CA. Also, I think the concept of integrating play is great for ALL ages, not just either end of the spectrum. Great idea to be getting useful movement outside with other people. Love it! Wish there was one in Manhattan. Are there any in or planned to be in Brooklyn? We need one in West Village and Chelsea. Great idea — gyms are too expensive, and trainers cost even more –but some supervised exercise should be offered in senior playgrounds, to help seniors achieve desired results, and so seniors learn how to to avoid hurting themselves (and/or others) on equipment provided. We understand that some fitness parks have weekly classes by certified personal trainers to help people learn how to use the equipment properly and insure they are getting the maximum benefits from them. Not sure if the classes are free or for a fee however. I think and adult park is a great idea. Many seniors will use it the adult park for socializing as well as for exercise. It would be nice if there were adult parks in White Plains, Scarsdale, area. I would love to see something like this in my neighborhood of Forest Hills, NY!! This is wonderful for all seniors. It would be very useful to have a senior playground at Inwood Hill Park, New York, N.Y.